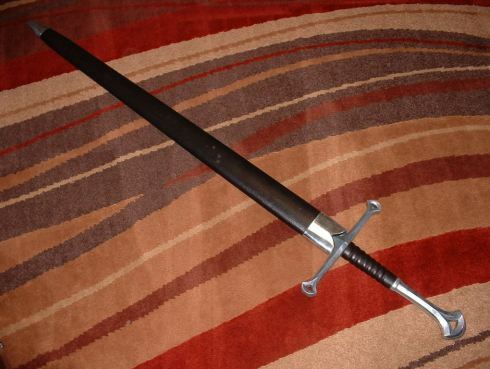 The Darksword Anduril Sword is a BIG and HEAVY sword - the kind of thing you'd want to use if you were of exceptional build and strength and need to quickly clear through a room of pesky Orcs or something.. This might not appeal to everyone, but if it sounds like fun - you're going to love it.. 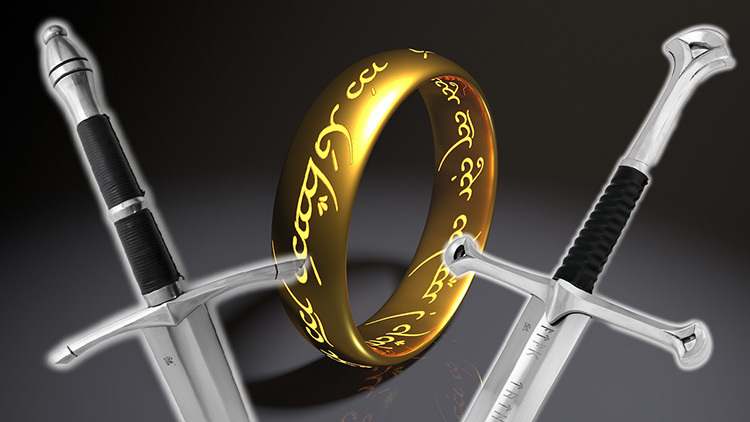 The core of this review is an old one and the sword in question has been updated and upgraded significantly since, so where necessary we have added the new information accordingly. Aragorn is my all time favorite real good guy hero. I like a lot of Good/Evil hero's like Elric of Melnibone. But IMHO very few truly Good hero's are written as well as Aragorn. It arrived well packaged as expected, thoroughly covered in some kind of preservative wrapped in plastic then newspaper. After Initial cleaning I was surprised at the mirror polish on the hilt fittings. Dry handling is pretty good considering the weight. Compared to the Ranger (click here for the review of the ranger) it immediately feels light. 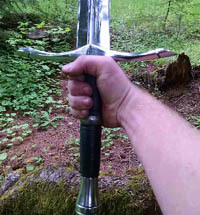 But where the Ranger feels amazingly quick for it's heft, Anduril feels more like my other swords in that it definitely is more blade heavy. With it's lighter weight and more blade Presence it handles more like my lighter longswords. Of the two I much prefer to practice with Anduril. At 12" from guard 1.85"
At 24" from guard 1.58"
At 34" from guard 1.39"
At 12" from guard .2140"
At 24" from guard .2110"
At End of fuller .2035"
At 34" from guard .2050"
Having read a lot about the difference in how a sword feels based on the amount of mass in the hilt components and it's distribution. I carefully weighed the components of Anduril and The Ranger to compare and I thought it worth sharing with you. The blade has nice clean lines with some evidence of hammering. The polish is even with no evidence of grind marks. The steel shows what looks like a substantial Grain(the only word I could find to describe the appearance) under the polish. The characters on the blade are consistent and even. The edge is fairly consistent at 1mm. There is some variation in edge thickness corresponding to the hammer marks in the blade but while they are visible they are very small in dimension (0.01mm to 0.05mm). The grip is a nicely sculpted wood core with a glued on leather cover. 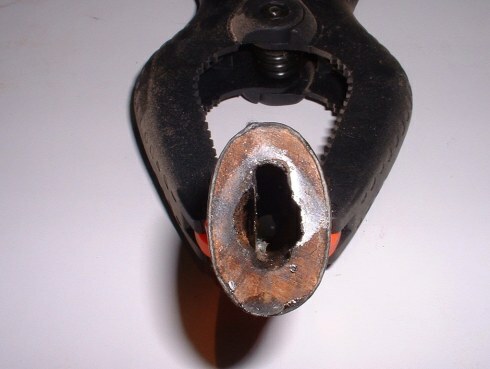 Oval in cross section with an overall taper from guard to pommel. Hexagon shaft with a smooth transition into the end design. The casting quality is good with only very minor flaws only on the inside edges of the design cutout. The polish is excellent. The Guard matches the pommel very well in design and finish. Of note is that while the guard fits SLIGHTLY loosely on the blade the visible space between blade and guard is minimal. A wood core scabbard with glossy black leather cover, with magnetic metal chape and throat. The fit between wood and metal parts is nothing special, functional. 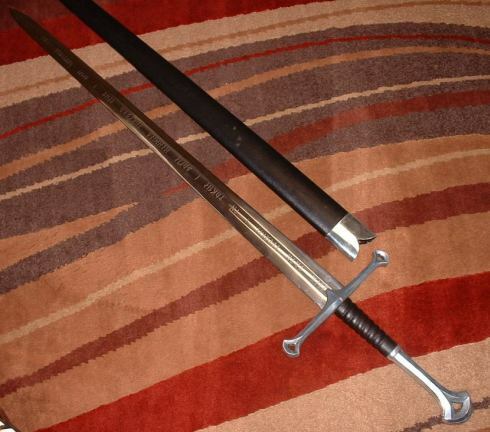 The ONLY one of its kind (all other Anduril Swords are made of stainless steel, or need to be custom made). 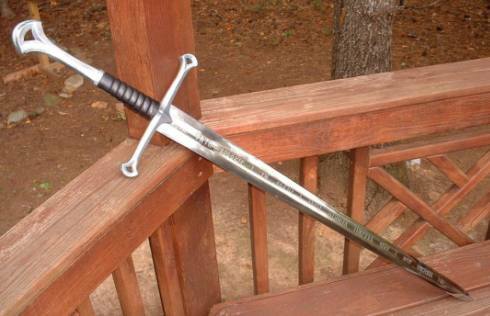 The video below was done with a semi-customized Darksword Anduril by Tom Kinder. Again, this is with the older model - the newer one is even better.. Recommended: Among the Anduril swords offered the carbon steel blade and accuracy to the film make this my 1st choice of those offered. Sadly the Anduril was discontinued in mid 2014 and is no longer available to purchase.